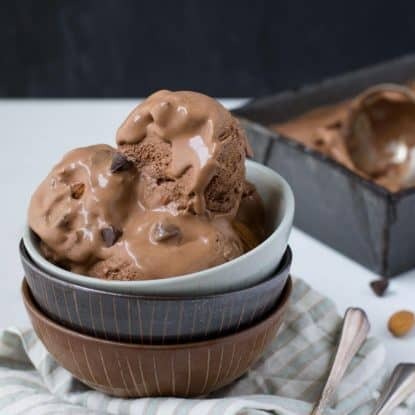 This Chocolate Almond Chip Ice Cream is rich and loaded with the healthy crunch of nuts and chocolate chips–delicious clean-eating at its best. 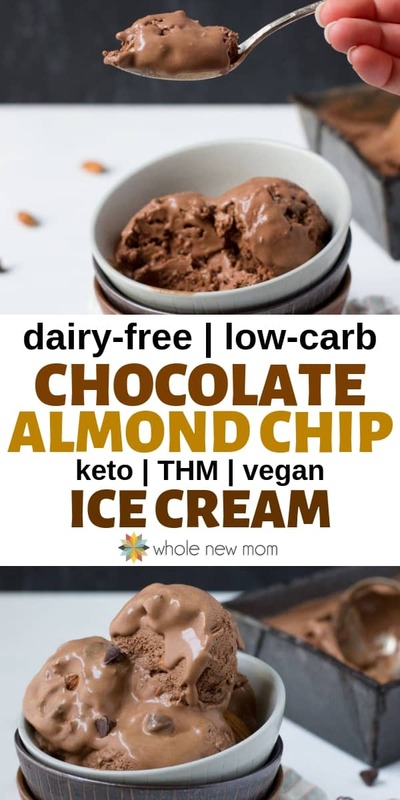 It's sure to please and is much cheaper than store bought dairy free ice cream. Plus, as an added bonus, it works for almost any special diet since it's dairy-free with vegan, paleo, low carb, & AIP options. 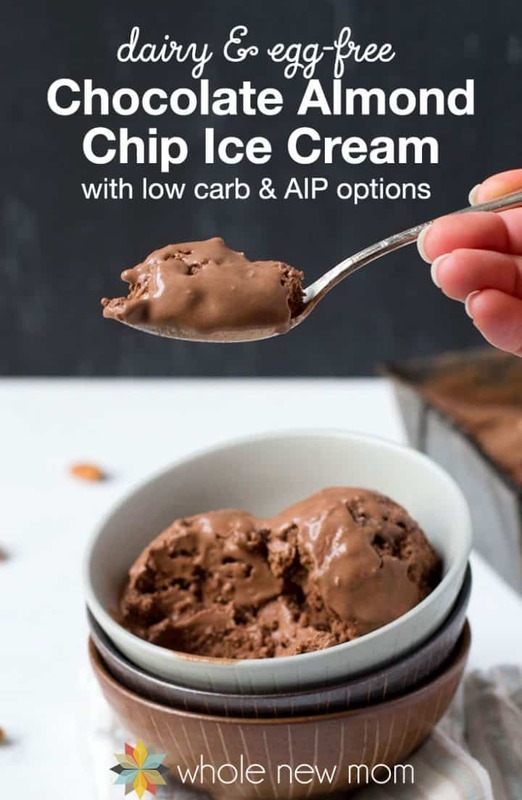 Here is another dairy-free ice cream recipe for Chocolate Almond Chip Ice Cream that will surely satisfy your sweet tooth! I mentioned in my post on Mint Chocolate Chip Coconut Milk Ice Cream that I never could make up my mind about which flavor to get whenever we went out for ice cream. Well, after writing about our trips to Friendly's and the Sampler of four small scoops that I would always get, I remembered that my other favorite flavor had always been Chocolate Almond Chip. I even checked out Friendly's website and though I couldn't figure out what other flavors I used to get, the Chocolate Almond Chip ice cream is still there. Now, I've never been one to turn down ice cream in any form (someday I'll share the gorey details of my summers working in an ice cream parlor), but ice cream full of chunks has always been a favorite of mine. If you feel the same way, then do I have a treat for you. Chocolate Almond Chip Ice Cream, full (really full) of almonds and chocolate (or carob) chunks. This whole dairy-free ice cream adventure started on our recent trip to Chicago. My family always likes to visit Whole Foods and Trader Joe's whenever we visit to grab some food to get us through our trip (since we never go out) and to stock up on a few things. Well, this time we got the chance to sample some coconut milk, no sugar-added ice cream. And we were hooked. And wouldn't you know it – it was on sale. Good thing –the regular price was something horrendous — even on sale it was $3.59 / pint. Well, though I am not one to spend $3.59 a pint on anything, I splurged on Mint Chip as well as Chocolate flavors and some gluten-free cones. Guess what our breakfast was the next day :-)! The consensus in our family was that the chocolate was too bitter. Well, not this version. It was gone-gone-gone in our household in a flash! Oh, and since you're here, I'm sure that you'd be interested in the other dairy-free ice cream treats on the site. How about….. I used the Cuisinart Ice Cream & Sorbet Maker to make this, and it turned out great, but you really have to follow the directions with this machine. 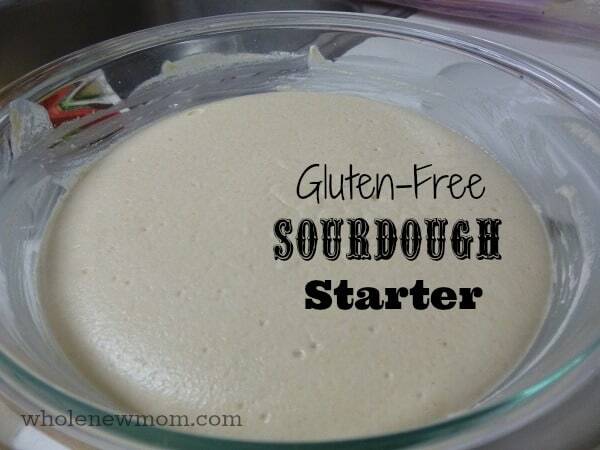 The bowl needs to be completely chilled in the freezer first, used immediately, and the mixture needs to be chilled. Otherwise, it's “soft serve city” :(. Carob: You can use organic carob powder instead of cocoa for AIP. Coconut Milk: My Easiest Coconut Milk is a great homemade option. You can, of course, substitute dairy or other milk alternatives as you like. 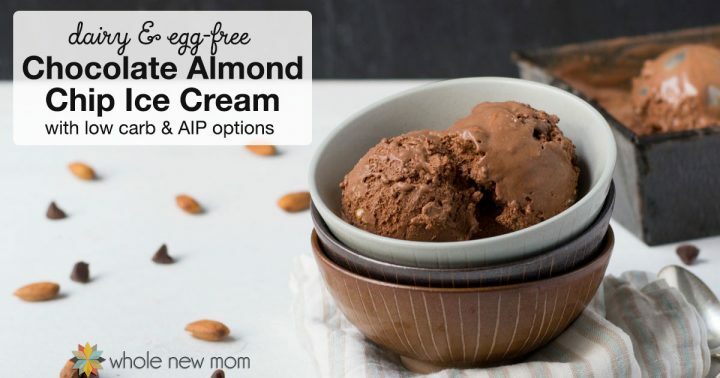 Among the dairy-free alternatives, almond will be one of the better options to promote creaminess of the final product, and my Easiest Almond Milk would work great if you would like to make your own. Sweeteners: Along with xylitol, organic erythritol is a good low-carb sweetener option. 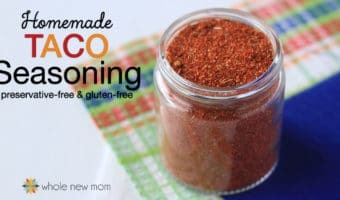 Use either maple syrup (here's how to choose a good brand), honey, or 1/2-3/4 tsp powdered stevia (here's a post on how to use it) for paleo — maple syrup, honey, or organic coconut sugar for AIP. Chocolate Chips: You can use carob chips instead of chocolate chips for AIP. Use my Homemade Chocolate / Carob Chips for a low-carb option. Almonds: Have the almonds be soaked and dehydrated if possible. Omit for AIP, or use chopped organic tiger nuts. Thickener: It would probably be OK to not use a thickener as long as you use MCT oil. If you do not use MCT, using gelatin or arrowroot will definitely improve the texture of the ice cream, but it will taste good either way. 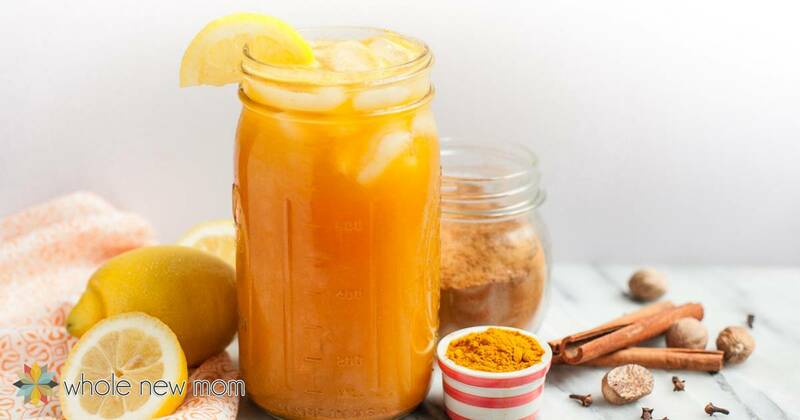 THM: If you are using a thickener and are on a low-carb plan (like Trim Healthy Mama), use gelatin, or about ½ the amount of organic glucomannan. 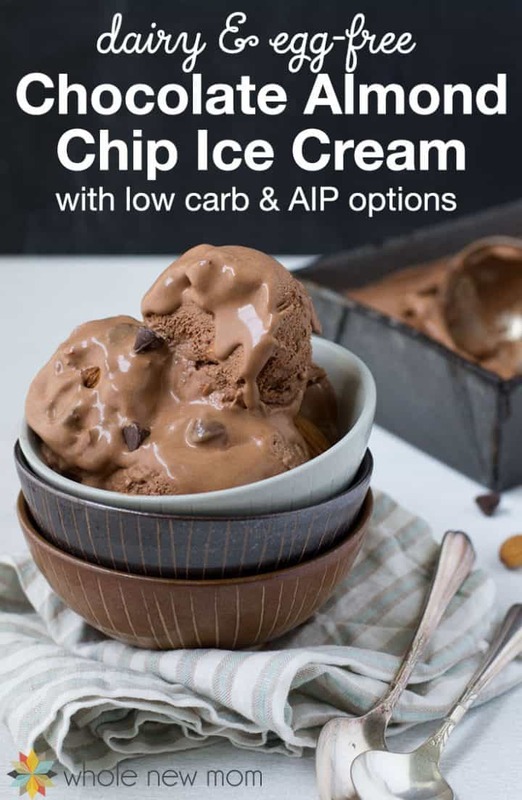 This Chocolate Almond Chip Ice Cream tastes great and is much cheaper than store bought dairy free ice cream. Vegan, paleo, low carb, & AIP! 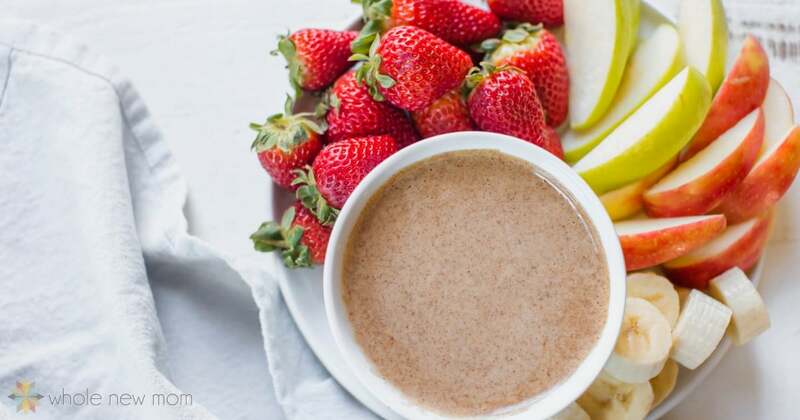 Add coconut milk, sweetener, cocoa or carob powder, MCT oil, gelatin (or arrowroot), vanilla, and salt in blender or food processor (NOTE: if using gelatin, add to coconut milk and let it sit for a few minutes before adding other ingredients). Mix well. Add mixture to ice cream maker and process following manufacturer's instructions. When mixture starts to thicken, add almonds and chocolate chips. Let me know how long it lasts (or doesn't) in your house! What is MCT oil? I’m new to making vegan ice cream and not familiar with the terminology. We just put a link to MCT oil in the post. Hope that helps! It really is looking delicious! Thanks for the tips about the arrowroot! I must try using gelatin in my recipes too! Hi Edi – thanks for reading and commenting. I am sorry but I don’t allow people to promote their blog names in comments so I had to remove that from your name. I’m getting those more and more so I’m not tolerating it any longer. Thanks for your understanding. Sorry about that. I assume that wasn’t your intention now. It has been happening a lot to me lately and most of the comments seem very stilted so they seem to be being made for the purpose of site / link dropping. I am going to think on this and figure out my policy going forward. Yes, a lot of people have blogs these days :). Yeah, probably people try to promote their sites here but I guess it’s harmless as long as those sites are real foodie sites. Have you tried adding a google recaptcha v2 plugin for the comment form? It reduced my spam greatly and it’s not a hassle for real users. You might be right on the comments w/ the URLs. It can be a mixed bag. I don’t know that I have tried that – thanks! Does anyone have a nutrition or carb count on this ice cream? Yes, I don’t at this point. I’m working on getting a way to do that for you. Thanks for your patience. Hi, just wanted to let you know (you probably already do since you offer alternatives in the recipe) that gelatin isn’t vegan, in fact it isn’t vegetarian either since it comes from animal’s bones. Thanks! Hi there. I have alternates listed in the recipe for vegan options. Thanks for reading! Hi. Thanks for the recipe. It was really good. I found the trick to making dairy free ice cream to be MCT Oil, which is extracted from Coconut Oil. I bought the NOW Brand. I added 3 Tbs to your recipe and it was just great. I used toasted carob powder, arrowroot, and did not add the almonds nor the carob chips (but I will be making those soon!). I also added Sunflower seed butter swirl from another website. Make the sunbutter swirl while the ice cream is churning and then place it in fridge to harden. Once ice cream is done, pour it in the bowl you’ll be storing the ice cream in, and use a spatula to mix in the sunbutter swirl. Wow – great addition. I was working on a swirl too- can’t wait to try this – thanks! I meant to say the MCT Oil makes the ice cream smooth, as I saw you mentioned you were working on perfecting that aspect. Yes, this is so perfect. Ice Cream on the menu for tomorrow! Or maybe tonight! Yup. I plan on it too! Gonna make more brownies too. ? I have a busy few days but I might just have to do that as well. Thanks! Did you use Homemade Coconut Milk for the ice cream? No I used store bought. It seems to do better but I will try the Homemade to see how the MCT works with that. Thanks again!